Top quality Rotary Brooms from SitePro® are used by contractors, municipalities, institutions, and farmers. The rotary brooms help remove dirt, sand, gravel and trash from construction entrances, parking lots, bridges, driveways and sidewalks. You can also remove thatch and prepare turf for the growing season. These broom attachments for skid steers and tractors are excellent for general clean up before sealing or repairing pavement. Also can be used for cleaning snow or leaves from streets, driveways, buildings and entrances. 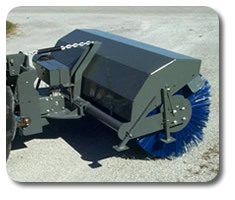 Skid Steer Rotary Brooms are hydraulically driven in 5-, 6- and 7-foot widths with 32" diameter brushes. Broom angles 30 degrees left or right. Height adjustment chains maintain even operating position and parking stand included as standard equipment. Variable flow control valve allows operator to adjust broom speed independently of engine or ground speed. 4.36 / 1 chain drive ratio for excellent torque. Heavy-duty #60 chain for long life. Step-through mount design for easy in/out of skid steer cab. View our literature. PTO driven 3-pt. 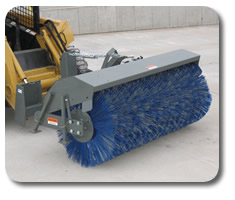 Tractor Mount Rotary Brooms in 5-, 6-, and 7-ft. widths with 32" diameter brushes. Double gearbox drive provides for smooth power tranmission and easy reversal of brush rotation. Broom angles 30° right and left. Parking stands are included as standard equipment. Top "T-Shaft" gearbox allows easy reversal of brush rotation. Designed for Category I tractors with 1,000 lbs. or greater 3-pt. lift capacity. Helps remove dirt, gravel, sand and trash from drives, roads and sidewalks. Rotary Brooms are perfect for cleaning snow or leaves. Used by contractors, institutions, municipalities and farmers.